The Lexmark T644n is a high-speed monochrome laser printer that is suitable for workgroups with high-volume printing demands. This is one of several models in the T644 series of printers, which primarily vary in terms of installed memory size and/or the capacity of the standard paper input tray. It will print on a wide range of media, including plain paper, card stock, labels and envelopes. In addition to standard toner cartridges, you can use high capacity or extra high capacity cartridges to both save money and increase your productivity. This printer can be equipped with the option of duplexing to help reduce the amount of paper used for print runs. This printer weighs 23.1 kg and measures 406 x 436 x 523 mm. It has a standard paper capacity of 600 sheets, and optional additional input trays can be added to increase the capacity to 4,100 sheets. To facilitate the workflow within your office workgroup, an optional 5-bin mailbox is available in addition to a variety of other finishing options. This printer features USB and ethernet network connection capabilities, while wireless connectivity can be added as an option. 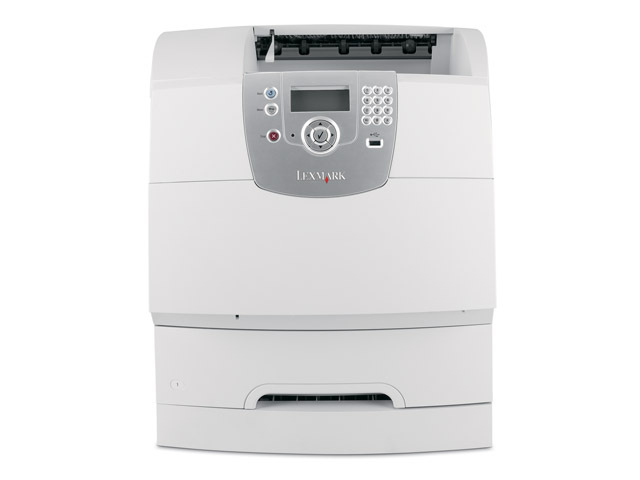 The Lexmark T644n is equipped with a 514 MHz processor and 128MB of RAM, and it has a maximum monthly duty cycle of 250,000 pages, although Lexmark recommends keeping monthly printing volumes between 5,000 and 30,000 pages. This device is solely for printing in black and white, if you require colour printing, copying, faxing or scanning capabilities, you would require an alternative device.